Almost inherently, art is about reactions. Whether it's the hint of the sublime you feel from viewing the works of an old master, the shiver of creeping horror you feel from photo essays on wars, or the button pushing jokes of performance artists, it's all designed to provoke some type of reaction from the viewer. This reaction can have various goals, of course, but it seems almost inevitable that it has one - even if the goal isn't found within the work itself, as in the case of so many contemporary projects that emphasise the variations of response that individual interpretations can create, it can be found in the exploration of said interpretations. Art asks us to think. When heading down the long road towards overcoming the reactions of the jaded art world and reaching through into the mainstream consciousness, how far is too far? The question grows ever more relevant in a world that is so bombarded with messages, both artistic and advertised, politically, spiritually, and economically, that artists are stepping up their game in order to make waves. Take the case of Alexander Selvik Wengshoel, a Norwegian artists who recently made headlines with a uniquely disturbing project he submitted for his graduate exhibition from art school. Recent art school graduates are notorious for ridiculously idiotic and asinine exhibits, but Wengshoel's project falls more on the disturbing side of the line. Born with a deformed hip that many surgeries failed to correct, he finally underwent a surgery that changed everything, and replaced his hip with a metal prosthetic that enabled him to leave his wheelchair and crutches behind. 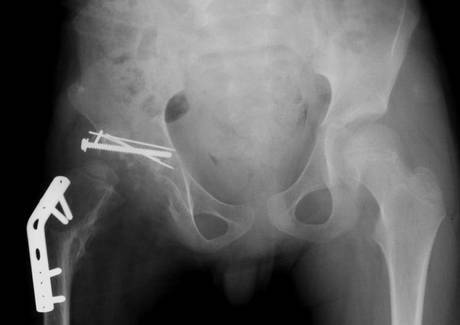 It also left him with a piece of his own hip, which he took home from the hospital. After a (remarkably small) bit of careful deliberation, he ate the meat from his hip, and submitted the bone as his graduate exhibit. Yes, you read that correctly. So we come back to the question of, 'How far is too far?' Wengshoel's rationale for the project is to explore the boundaries of personal space and what we can do with our own bodies, but this writer is a little suspicious of the seemingly -- if you'll pardon the expression -- unfleshed-out themes and explanation. He certainly grabbed headlines around the world, but did he go too far? Or is the simple fact that his submission is making us ask these questions enough of a justification for it in and of itself?